Just like the hair on your head, your impressive man-mane needs to be brushed to help make it look and feel its absolute best. As part of a daily routine, beard brushing serves to maintain and tame facial hair no matter its length or thickness. It also stimulates the hair follicles underneath, allowing for improved growth and overall health. If you like to wear your beard in a particular style, brushing it beforehand creates a smoother texture for general compliance. Similarly, if your hair is of a particular manly thickness and can become dishevelled quite quickly. A brush helps to keep the hair in place throughout the day, making you look just as handsome at 5 pm as you did at 9 am. Then there's the hygiene issue. I mean, let's face it, a matted, unkempt beard somehow manages to attract twice as much food and dirt and other smelly monstrosities as a smooth beard. So by brushing regularly, and spreading those nice natural facial oils through the beard, you can feel certain that crumbs and rodents will cease to find your bush an attractive burrow any longer. So how exactly do you use a beard brush? Shower and groom as usual first thing in the morning. Give your mane a good scrub with your best beard shampoo. Once damp, use a brush to gather a small amount of dry beard oil, or a put a nickel sized dollop of traditional oil into the centre of the brush. Then move the brush through your beard starting at the root and drawing the brush to the tip. Be gentle, and don't rush. Ensure the oil or balm is evenly distributed. Use a hair dryer or towel to dry your beard fully. If using a hair dryer, incorporate your brush by running the bristles through your hair periodically. This will assist in keeping it straight. Once dry, give your beard a final brush. Top Tip: If you have a very large mane, brush your beard before you go to bed, this will make it more manageable in the morning. Before you begin shopping for the perfect brush, you need to know what you're looking for. If you have a full curly beard, your requirements will differ to those who have a goatee and tash. Beard brushes can come with synthetic bristles or natural bristles (usually boar or horse). Natural bristles tend to be varying lengths, which allows the brush to cater for all of your beard as you brush, rather than just the surface hairs or deep hairs. This means less brushing, which results in fewer split ends and hair damage. Natural bristles are also particularly effective at spreading oils evenly across the hair, creating a healthier, happier appearance and texture. Synthetic beard brushes can ‘do the job’ if you're in a hurry or have no other options, but may work better on shorter beards than full ones. Where possible, it is best to use a natural bristle. Here are our top ten beard brush recommendations. Superior Design: Firm enough to exfoliate the skin and stimulate follicles, gentle enough to brush your beard without pulling or tugging. No Mess Application: Great for applying any beard oil, balm, wax or our signature Dry Oil without getting your hands dirty. Built for Each Other: Complements our Beard Oil and Beard Dry Oil (beard balm), making sure the product is evenly distributed throughout your beard. Are you a man on the go? 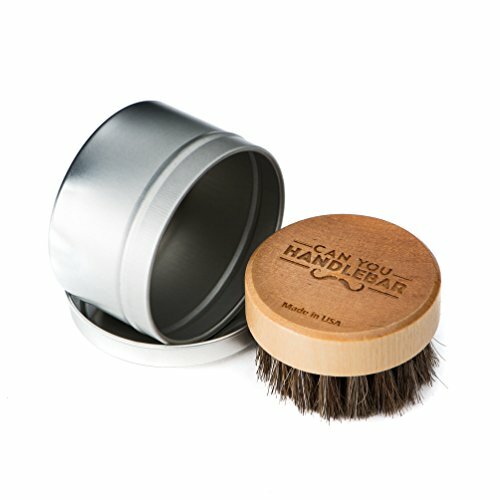 If you travel a lot for work or leisure, you may want to consider taking a travel sized brush with case, such as that offered by Can You Handlebar. The brush is small enough to be cupped in your hand making it very convenient. The bristles are made from 100% horse hair, all measuring at varying sizes meaning that they reach every hair on your beard. They provide a soft, massaging sensation, ensuring that you feel your very best when grooming each morning. It is easy to wash the bristles on this brush and does not require soap to remove any excess oil. Therefore you won't need to worry too much about mess, or the bristles becoming worn down. The handle is round and made from solid, stylish wood, giving it a sophisticated look. It also comes in a simple, protective metal rounded tin, with the Can You Handlebar logo displayed proudly on the front. What's nice about this product is that is pairs perfectly with the Can You Handlebar Beard Balm, giving you the very best results while on the move. Might be too small for some men, especially larger beards. 100% BOAR BRISTLE - No synthetic, plastic, or nylon bristles, only 100% boar bristle. UNTANGLE, TAME & STYLE - Take control of your beard and how you present it to the world. A HEALTHIER BEARD - Helps to remove dead skin cells and residue to promote a healthier beard. If you're man enough to be sporting both a beard and a moustache, then this beard brush could be for you. Let's start by looking at the brush. Made from 100% boar hair, this oval shaped brush works wonders on beards of all sizes and shapes. The dense bristles massage the face and stimulate hair growth while failing to forget those hard to reach areas. This brush is particularly effective in reducing static, so could be ideal for wiry, untamed beards. Useful for men with both a moustache and beard. If you're looking for a no-nonsense beard brush that does the job, then look no further. The Military Round Bamboo for Men beard brush by The Better Boar Co is a robust brush with medium-stiff bristles for a gentle but effective result. Military style beard brushes tend to be a little bit more rigid than similar competitors, so are most appropriate for men who prefer a harder brush. 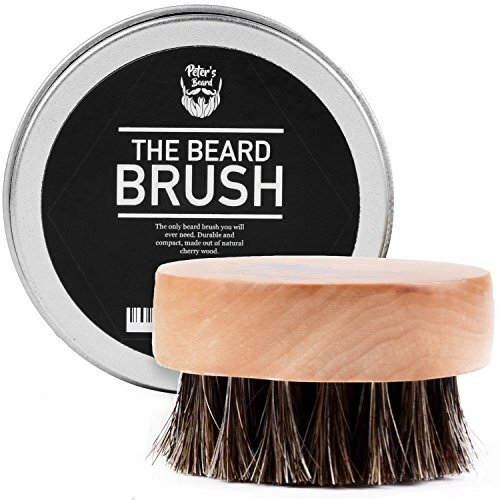 The bristles are made from 100% boar hair and provide just enough stiffness to dig into deeper beards, while still giving a smooth and comforting sensation. As these bristles groom the root of the hair, they're likely to stimulate fresh hair growth and will spread your natural oils evenly across the hair. 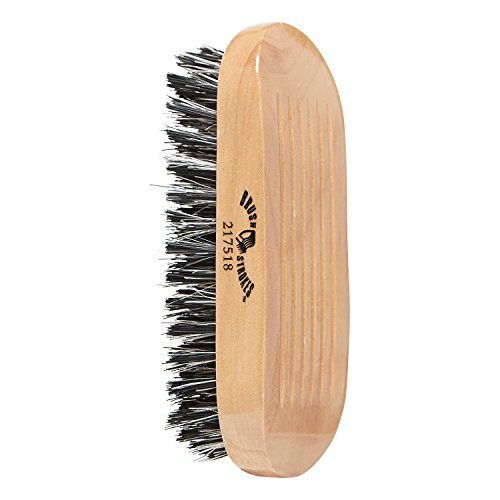 The military style grip on the outer wooden handle means you can pick this brush up in a hurry and comfortably tend to your mane without any hassle, pulling it in a variety of directions with ease. The Better Boar Co are committed to using authentic, natural boar hair for the best results. FEELS AMAZING - Highest quality horse hair on the market. Soft on the skin, great for the beard. 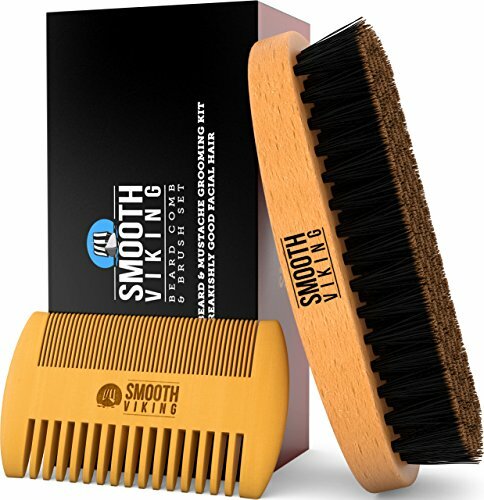 Your beard will look great after brushing and styling, and you will love doing so with this premium quality brush. THE PERFECT SIZE - Small, round and portable. Our brush allows for comfortably combing your beard. The round shape allows for a firm grip and feels great lying in the hand while styling and grooming your beard. NO MORE MESSY BEARDS - Use the brush to untangle, straighten and soften your beard. Our beard brush will make your beard look and feel great, and will keep it that way. Partners up great with butters, balms and oils to give you that edge, that finishing touch, the beard you want to see in the world. The beard brush is a finely bristled, pocket-sized brush made from 100% horse hair. The horse hair is incredibly soft and calms beards that are prone to causing itchiness and irritation. Perfect for thinner, shorter beards, this brush is designed to give you that neatness you need for an important business meeting or night out in the town. Due to the compactness of the product, it's easy to take anywhere. It comes with a rounded, metal tin that conveniently contains the brush and keeps it protected while in a bag or suitcase. This makes it great for men on the go, or for those that like to do a bit of midday grooming in the office. The natural smooth wooden handle is easy to hold, and fits perfectly into any sized hand. It also features the company logo and looks sleek, stylish and minimalist. This beard brush is completely eco-friendly and ideal for men who like to buy ethical products at any opportunity. QUALITY GERMAN PRODUCT: Hand-crafted in Germany with premium materials. PEAR WOOD EXTENDED HANDLE: Brush with precision, thanks to the extended natural pear wood handle! Sometimes a beard brush is a lot more convenient to use if it has a longer handle, a bit like the kind of brush women use on their hair. That's exactly what the Zeus Boar Bristle Brush offers. Zeus Beard are a well-established men's grooming company that are committed to providing quality products for men of all ages, lifestyles and beard types. Made from 100% boar bristles, this beard and moustache brush measures at 5.5 inches in length, with bristles that are just over half an inch long. This makes it the perfect size for a quick but thorough brush before work in the morning. Due to the shape of the brush, it's not particularly compact. This could make it awkward for travelling with, so perhaps this brush is better suited as a permanent bathroom feature. On the upside, unlike rounded brushes, the Zeus Beard and Moustache Brush can help you achieve a more precise moustache style and shape. The handle is made from pear wood, which is smooth and easy to hold. It also sports a cool Zeus logo, making it particularly eye-catching and stylish. The bristles are just the right length to spread oil or balm in all the right directions and can be used on either long or short beards. For high quality, masculine results, pair the brush with the Zeus Sandalwood Beard Oil. BEST BRUSH FOR BOTH LONG AND SHORT BEARDS: This Beautiful Beard Brush by The Beardman is a great addition to a head to toe grooming regimen, for men with both short and long beards. Great for Beard, Mustache & Head Hair. EASY TO USE WITH A SOLID BAMBOO HANDLE: This handheld brush fits well in the palm of your hand for easy use. 100% BOAT BRISTLE FOR COMPLETE CONTROL: Made from pure boar bristle it helps distribute hair's natural oils from root to tip promoting shine and increased smoothness of beard hair. The satin, bamboo wood handle adds functionality and style to this classic hair brush. Suitable for all hair types. If you're looking for a beard brush with a softer bristle, then look no further. 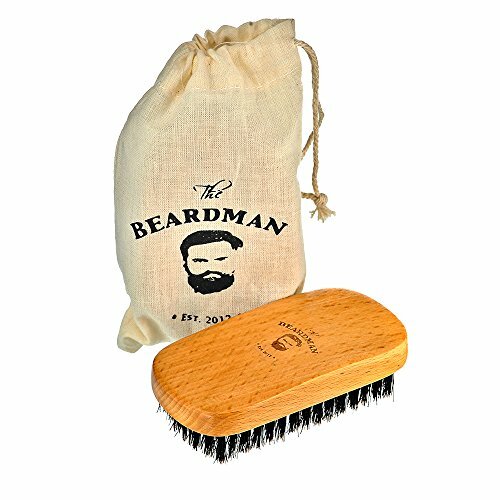 The Beardman Beard and Hair Brush is made from 100% soft boar hair, and is perfect for grooming medium length beards with ease while massaging the face at the same time. With bristles like this, you can be assured of a comfortable experience. Its rectangular handle is made from good quality beech wood and bamboo, and is just the right size to provide a secure grip. It also features the Beardman logo, which is particularly well known in the men’s grooming community. There is one possible pitfall with this product. If you have a moustache, or want to style your beard in a precise way, you might find this handle-type a little tricky to manoeuvre, as it can easily block your view. 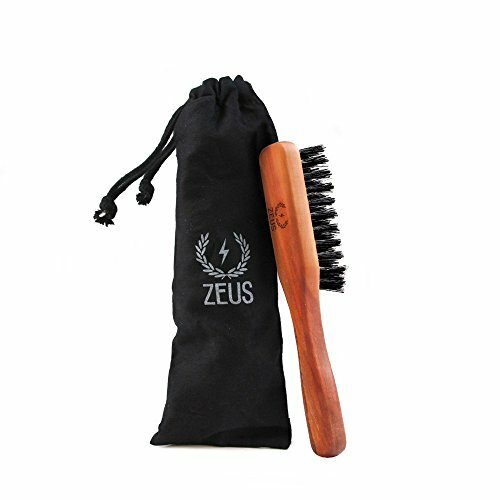 This cool brush comes in a pale drawstring bag, which makes it ideal for travelling with on holidays or business trips. It also makes a great gift for some of your trendier friends. If you've not heard of Beardman before, it's worth checking out their website and browsing their range of high-quality beard and men's grooming products. Natural Bristles for shine, condition, and polish. 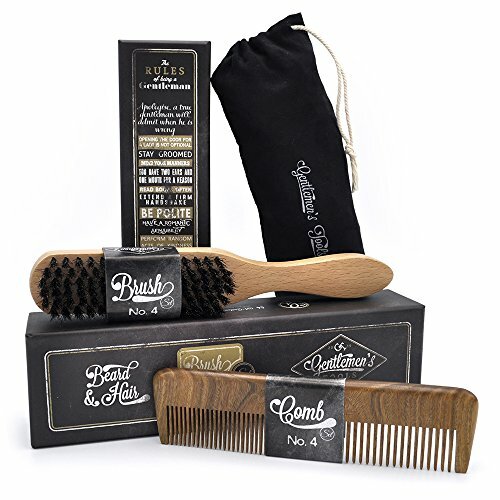 The Bass Brushes Brush in Classic Men's Club Style is a beard brush with attitude and charisma. Firstly, the design deserves some recognition. The long handle on this beard brush is striped, with a tan and brown coloring combination, making it unique and individual. Unlike oval or square handled brushes, the Bass Brushes Brush has a long maple wood handle that you can use to gain precision when grooming. For this reason, it's really useful if you've got a particularly well-styled moustache that requires TLC. The wild boar bristles are softer than many alternatives on the market. While stiff bristles can work miracles on tough, curly or thick beards, they aren't necessarily appropriate for men with thinner hair or sensitive skin. When you apply your favourite beard oil or beard balm to this brush, it'll be sure to massage the oils gently around your face and hair. There's no case or container that comes with this brush, and given its shape, it might not be too convenient to carry around with you. However, as a centrepiece in your bathroom, the Bass Brushes Brush is certainly a good choice. Might not be convenient for travel or business trips. SANDALWOOD BEARD COMB - Premium Quality - Handmade - Wide tooth - Enjoy the light fragrance of fresh Sandalwood. Feel the strong smell of your Grandfathers workshop with the scent of smoked sandalwood tree that radiates from this comb. 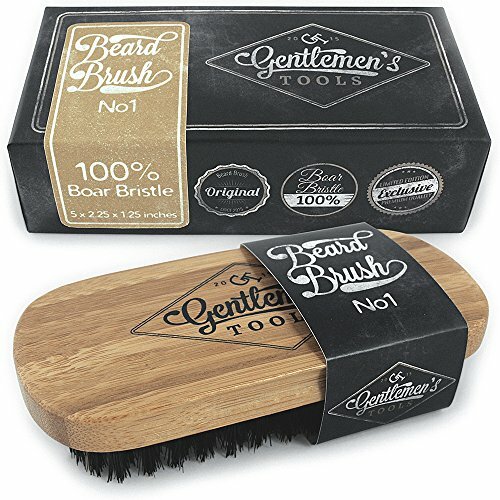 100% BOAR BRISTLE BEARD BRUSH - No mix synthetic, plastic, or nylon bristles. Real hard/soft medium stiff bristle - hog/pig no horse like others. Handle made from hardwood in military style for every striking viking smooth face. For comfort daily moustache shape and grow. Classic barber salon handcrafted multipack. COMFORTABLE TO USE - size allows to take it everywhere you go. Keep this accessory in your jeans or shirt pockets. You can take it to the club or the mountains for a trip and travel. Perfect for grooming or even spreading ml of beard oil or beard wax. This Beard Brush for Men is sleek, sophisticated brush made from 100% boar hair. It's minimalist, but stylish design includes a long, solid bamboo handle that allows you to see exactly what you're doing as you brush. This means that if you are sporting a rather full beard and moustache that requires a lot of precise pruning, this brush could be ideal. The wood itself also has a nice colour design, with streaks of pine and tan, making it look great in any men's bathroom. It's also very lightweight for convenience. The bristles on the Brush are made from 100% boar hair, with no synthetic materials snuck in. The bristles are of medium stiffness, so it's a good all-rounder regarding the type of beard it works best on. The length of the bristles provide a comforting massage, relieving irritation and itching from wiry hair types. It also does a good job at spreading beard oil around the full length of the hair, ensuring not to miss any. PURPOSE - Boar Bristles black hair means no itchiness or scratching no snag ever. Keep your thicker beard trim and tidy. Feel the light fragrance of your Grandfathers workshop with the scent of Boar Bristles and fresh wooden item. The same Premium Quality like our Sandalwood Beard Comb. Gentleman’s Tools supply cool, compact and convenient products for men across America and beyond. Now you can get your hands on a very stylish, highly effective beard brush to craft and care for your mane. Made from eco-friendly bamboo, the handle on this brush is rectangular, with smooth edges so that it fits comfortably in your hand as you brush. It also features the well-known company logo, which gives it an upmarket appearance. The bristles are made from 100% boar hair and are of medium length and stiffness. This means that as you work the brush through your beard, you'll find it spreads oils evenly and gives your chin a good massage at the same time. The beard brush comes in a slick charcoal box, which can be used to store the brush in a convenient and safe way. The box also allows for easy transportation in case you enjoy frequent holidays or business trips. The brush can be used on wet or dry beards, and is especially effective on itchy or irritated skin types due to its gentle yet firm bristles. If you're the type of guy who likes to buy natural, ethically sourced products from companies that care about quality over quantity, then the Beard Brush for Men could be for you. The Rocky Mountain Barber Company was formed in 2014 and aim to provide for each person's individual grooming needs. With nature at the forefront of their company mission, they like to use eco-friendly, natural materials and ingredients to create high-quality products that do the job. The handle on the Beard Brush for Men is crafted from poached wood, and has a shiny brushed black finish. 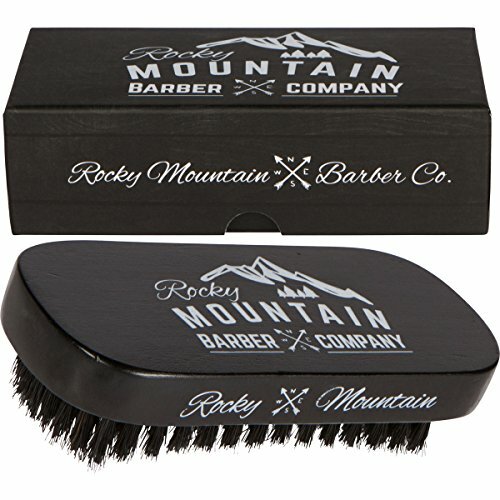 It is also branded with the Rocky Mountain Barber Coat of Arms, making it stand out from similar brushes on the market. It is rectangularly shaped with soft, sanded edges, making it comfortable to hold and easy to manoeuvre. The soft bristles are made from 100% boar hair and work at gently smoothing beard hair while massaging the face and neck. These are not stiff bristles, so may be best for men with shorter, finer beards. The brush comes in a very trendy box, with a simple yet stylish and upmarket design. For this reason, it's the perfect gift for any bearded bloke. The box also provides handy storage, making it great for travel and keeping safe. Choosing a beard brush requires some self-awareness about the type of beard you have and the look you're aiming to achieve. If you've a long, thick bush that needs a lot of heavy grooming, then a firm bristled military brush would be perfect. If, on the other hand, your facial hair is fine and intricate, then a softer, longer handled brush would give you the precision you require for your look.